The Train to Impossible Places by P.G. Bell is an exciting middle grade debut that young readers will not be able to put down. Suzy loves physics because there are rules for everything and everything follows the rules. One night Suzy is awoken to strange sounds and she finds tracks going through her house. These are the tracks for The Train to Impossible Places, before Suzy knows it she hops aboard and is now a deputy postmaster. Now Suzy has been introduced to the fuzzics, like Physics but fuzzier. Suzy meets Prince Frederick on her first delivery, transformed into a frog and trapped in a snow globe. One the Run from Lady Crepuscula with Frederick who holds valuable information that could lead to the takeover of The Union of Impossible places. Young readers will love exploring all the Impossible Places with Suzy and with more books coming readers are going to be excited for the next installment. 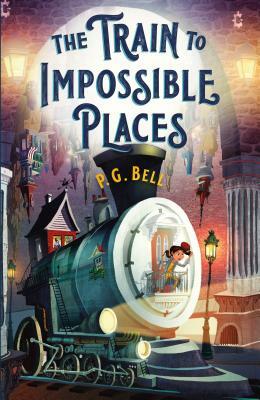 The Train to Impossible Places is available now! About Amanda: I have been in the book industry for 18 years starting in a bookstore at 15 and now with Macmillan for 2 years. In my free time I enjoy traveling, playing on my pool team and training for half marathons.